I got new shoes. For some reason this is what I want to start this post with, because I got some new shoes and I’m happy. I got my yearly pair of black Converse Chucks, which I usually buy in the spring and then I got a pair of Adidas Court Vantage. I’ve never owned a pair of these before and I am now so in love with them I’m afraid to wear them, because I don’t want them to get ruined. But they’re seriously beautiful. For all you sneaker lovers, I can say that the Court Vantage are lighter and seem more comfortable than Superstars, so I’m tucking the latter away until fall. The weather has been lovely, but pretty rainy lately, hence me being reluctant to wear my new CVs. It also gets pretty windy and cold in the evenings for this time of year, which has actually been a good thing for me this week. Because what’s been going on besides my shoe shopping thing is my neck thing, that’s what I’m calling it. I’ve had some mild neck/collarbone pain for a while now, but this week it all got a lot worse. It was either the wind or me sleeping funnily that made it that way, but my neck has been killing me and all I’ve wanted to do these days is watch TV in the least painful position I can find. My super nice doctor did give me a few prescriptions and they’ve helped me tremendously. Now all I hope is that things keep getting better, so I can get back to normal. I also hope the nature stays on my side for a little while too, because otherwise I’ll be looking like a fool walking around with a scarf all the time. However, what I really care about most is how I feel, of course. 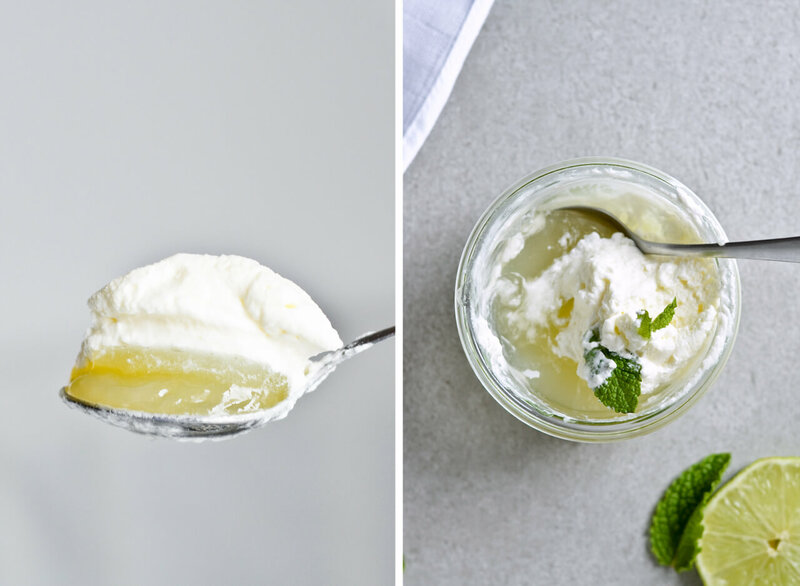 And this Italian lime pudding has helped too, I can tell you that. This pudding is what Italians call gelo. I first spotted a recipe for gelo in the Southern Italian Desserts cookbook which includes two gelo recipes, one made with mandarins, the other with watermelon (#drool). But I wanted to make my own with limes. 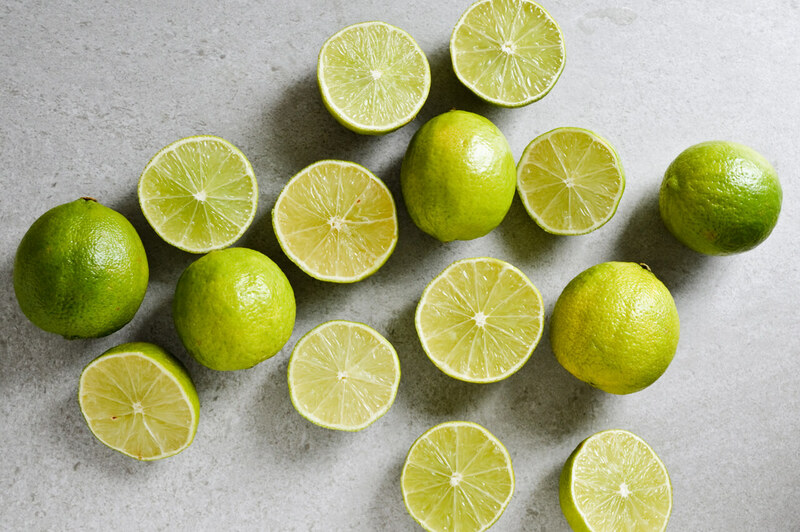 Limes are just the most wonderful thing in the world, with their vibrant color and aroma. I’m in love with the crisp yet sweet smell. Actually as I write this, I’m making a little mental note to buy lime candles. Do you know of any good ones? 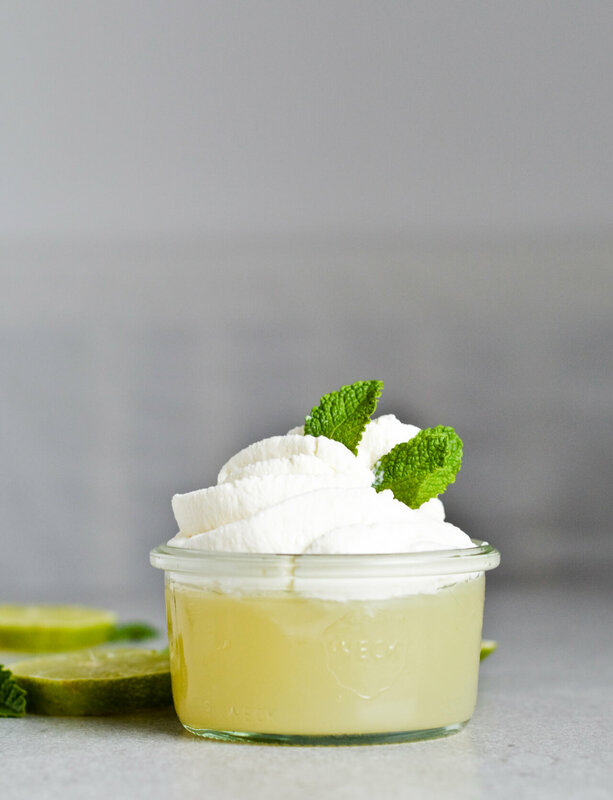 If you look at this Italian lime gelo, it looks just like jello, but don’t let looks fool you. This gelo is made with no gelatine. It is actually made with just 3 ingredients, which are lime juice, sugar and corn starch. The starch is what gives it the thickness and structure. However once you take a spoonful, the pudding is very smooth, like an actual pudding and it melts in your mouth. 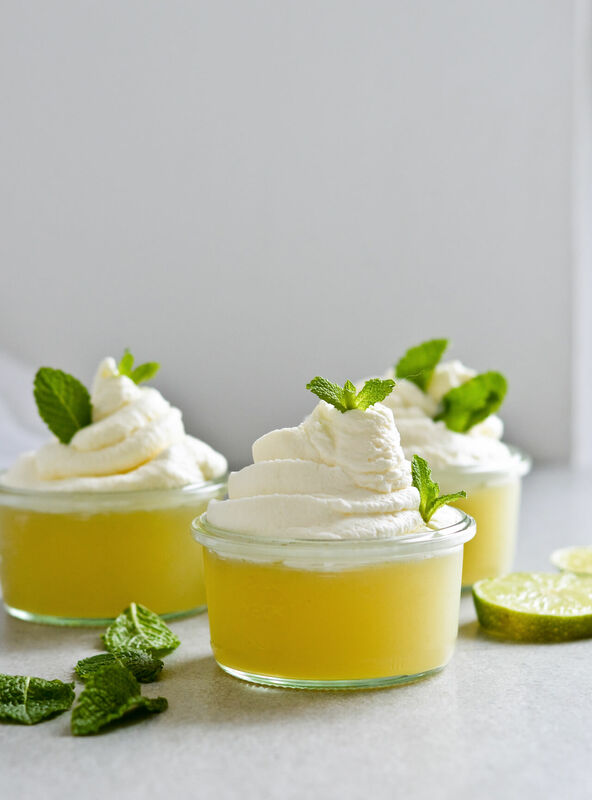 As this is made with lime juice, it calls for a lot of sugar. 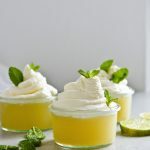 Of course how much sugar you use depends only on you and your taste, but even as a citrus lover I can tell you that 2 cups only seems like a lot and really isn’t, as lime juice is seriously sour. To combat this sourness and the amount of sugar used I’ve also made this recipe with half water and half juice. As limes are so strong, you can’t really tell that the juice has been diluted with water. The water also doesn’t change the texture of pudding. The color might be a tiny bit lighter, but hardly noticeable. 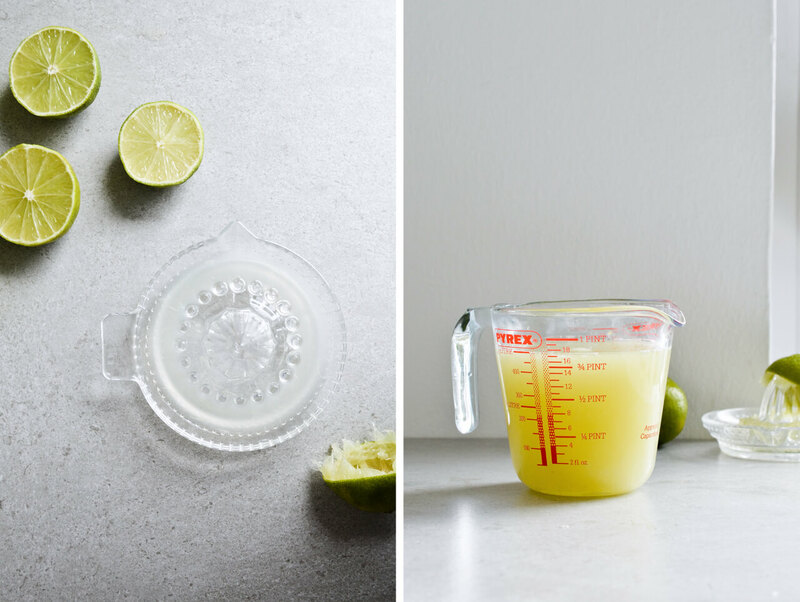 So whether you dilute the lime juice or not is up to you, but both versions work. 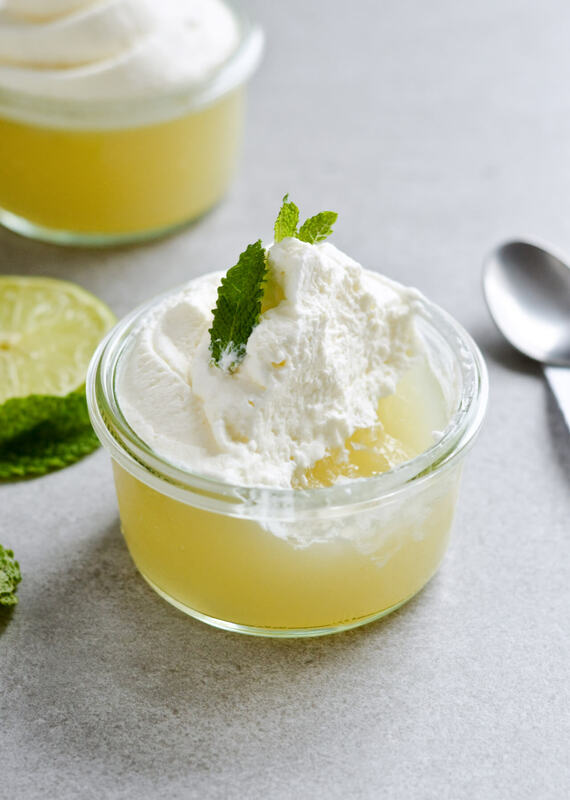 The best way to eat this Italian lime gelo is with sweetened whipped cream, although it’s good on its own too. 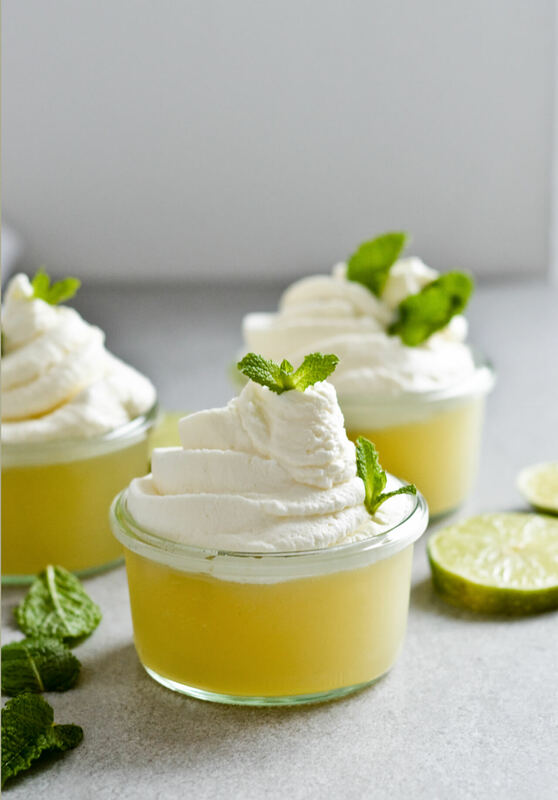 Overall, this is a very refreshing dessert, served cold straight from the refrigerator and it’s the perfect treat on any warm day. A refreshing dessert perfect for warm weather that tastes like a popsicle. Recipe makes 4 small (200ml / 6.7 fl oz) puddings. Fill 4 ramekins with ice cold water and set aside. 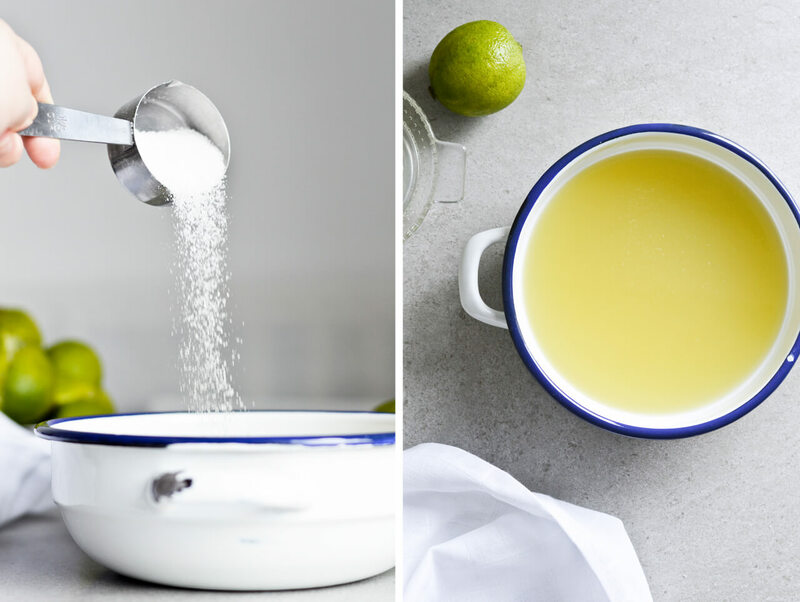 If there’s a lot of pulp in your lime juice, first drain it through a sieve. In a saucepan (I prefer enamel for this) combine lime juice and sugar. Cook on medium heat until sugar completely dissolves. Taste to see if you want more sugar and keep adding it until it fits your taste. Quickly stir in the cornstarch. Bring mixture to a boil, stirring constantly with a silicone whisk or spatula. Cook until the mixture thickens, this takes a few minutes, until it starts to cling to the spatula and looks, for lack of a better word, slimy. Remove from heat. Empty the ramekins and shake off the water, then quickly divide the pudding between all the ramekins. 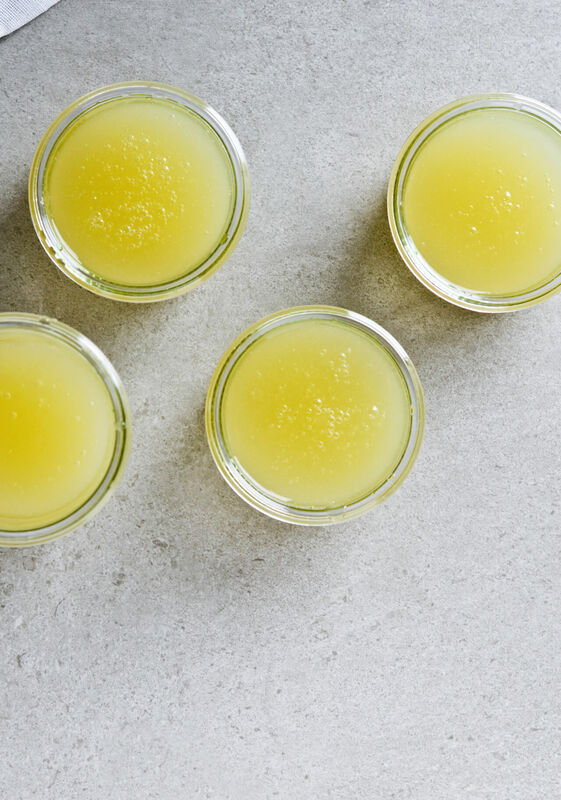 Let cool completely, then cover each ramekin with a lid or plastic wrap and continue chilling in the fridge for at least 6 hours or overnight. Combine cream and powdered sugar in the bowl of your mixer. Whisk on medium speed until cream form stiff peeks. Store in the fridge as the pudding is chilling. 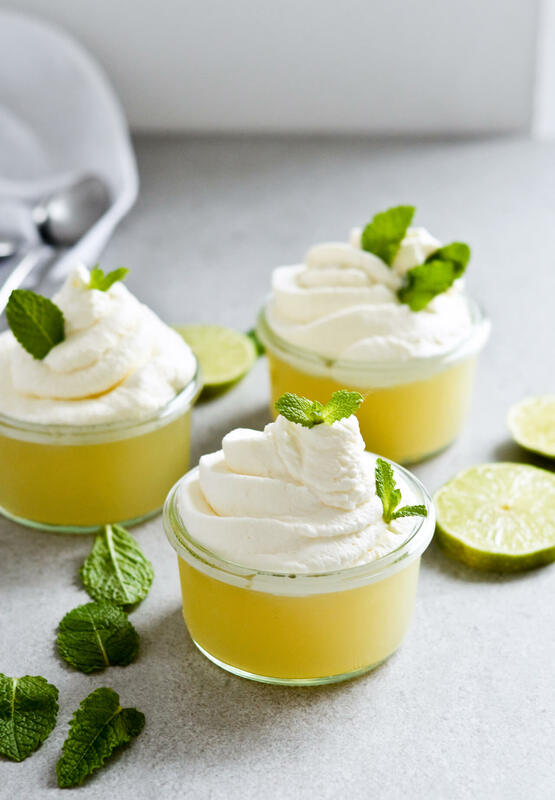 When ready to serve, take pudding out of the fridge and decorate it with cream and fresh mint leaves. Pudding keeps in the fridge for up to 2 days. 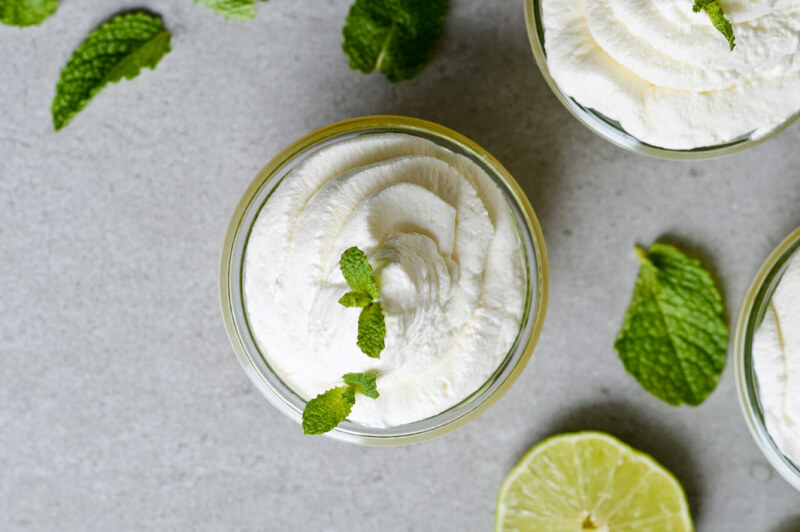 About whipped cream: To make the cream look really pretty, without much work and props, store freshly whipped cream in a Ziplock (or similar) bag. Twist the bag as you would a pastry bag and push cream towards one corner. Snip of that corner then decorate the pudding. Recipe inspired by Southern Italian Desserts cookbook. Is there a Mitzy recipe you’ve made? If so, let me know here or on Instagram and tag your photos with #mitzyrecipes! I’d love to see them.